Dr. Vidur Kumar grew up in New Delhi. He obtained his B.D.S. from Annamalai University. He then attended the College of Dental Sciences , Davangere where he received his M.D.S. in Orthodontia. 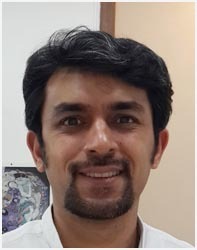 Thereafter he started private practice in New Delhi and has been associated with our clinic for the past 12 years where he has ensured that our patients receive the highest quality of care. More than 2000 adult and pediatric patients have successfully undergone orthodontic treatment under his skill and supervision at our practice.